Nearly two years ago Bill Callahan emerged fully accepting of his non-Smog identity and provided a beautiful, pastoral album called Sometimes I Wish We Were An Eagle. Callahan's undeniable voice will not be forgotten, but with this year's Apocalypse, he has more fun with sonic additions and song structure and takes a break from simple poetic beauty. This is an album of dire, sometimes sparse epics that demand listening attention. Often, the full scope of the song's narrative and it's musical structure seems continuously mysterious. These are songs that can't be pinned down largely in the way that we have really no control over the mythical end of the world, except how, as I recall discussing with my dear friend Jon, the apocalypse will ultimately be people-driven. Still, Apocalypse rides that context, and the subtext. The Apocalypse is unclear. It's a fright and a devastation, but it remains difficult to understand, comprehend or even prepare for. This isn't going to be your canned corn and stock-piled toilet paper kind of rodeo. What we think we can predict won't be of any use to us. The point being that Bill Callahan connects Apocalypse with lots of references to plans gone awry, to the break down of wild, open freedom. And with some boundary breaking song structures that border on chaos... even as they remain beautifully pleasing to the ear. This unpredictability is not necessarily a sudden transformation for Callahan, whose catalog of baritone-sung folk/country/rock story-songs often resemble Johnny Cash's late-period American Recordings series. And Callahan has always been successful at putting beauty in stark contrast with coarse ideas, somewhat strange song designs, but Apocalypse has the unique feel of a world falling apart. Even as Callahan's voice remains sturdy, we hear his guitar occasionally wander, sometimes crashing into minor breakdowns that so beautifully and intentionally illustrate the tenuous grasp we hold on order, whether in music or in our world. This theme reaches a poignant, on-the-nose-but-still-amazing apex on the marching, jazz-fusion-vibed, almost spoken word satire "America!" Callahan speaks over the bounding drums and quick screeching guitars about watching David Letterman, Afghanistan, Vietnam and other serious social and political topics, even admitting, after reading off the names of soldiers, "I've never served my country." The song is incredible, impacting and epic, but in a way that feels like the frank reworking of '60s era protests. Elsewhere on the album, the opener "Drover" is simply fantastic. It's a dark story of mistakes that wanders from format to format, keeping you ever on your ear's toes. And there are several points, at least for this regular Callahan fan, where the song seemed to logically end, only to pick up quickly after. "Baby's Breath" provides a more direct Callahan song for those expecting/wishing for the sound of 2009. "Universal Applicant" dances over a faint flute and tapping keys that are reminiscent of classic motown. And he adds some little accents, laughing briefly in the song, playing with words in such a way that the song is more performance piece than mere music. Think Serge Gainsbourg and how genre/style are backing to a sort of individually expressive narrative. "Riding For The Feeling" takes the role of a more traditional song of lamentation as it cries sonically over a goodbye and the line "All this leaving is never ending," which lands directly atop beauty and genius at once. Callahan has a tendency to just flow lyrically and all that pseudo-rambling serves to make this song more sad, until it's nearly impossible want it to stop, in the way that some break ups can last so long that you almost wish they'd go forever because you could still hold onto that person. "Free's" runs back into a distinctly jazzy territory and carries with it another great line: "Is this what it means to be free, or is this what it means to belong to the free," hence the track's title. It is a jangly lament that leads perfectly to the slow-burning, cool and calm "One Fine Morning." The song takes on powerful religious imagery as Callahan speaks to his apocalypse, garnished with strong piano, until the drums and cymbals come in and the song takes a truly overflowing shape. Sometimes we know great music when we hear it. This is one of those albums. 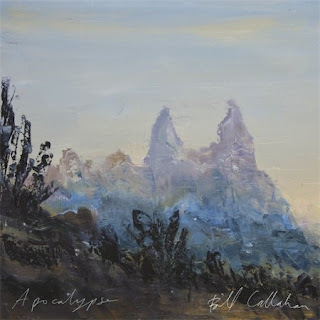 Bill Callahan was never going to be a universal go to artist, but with Apocalypse, he expands his expression both musically and lyrically to tap into a reservoir of shared human dread, love, sadness, fear, and dignity. I suggest you purchase this album posthaste. Until you do, a little taste is offered below.